During September 1946, Django Reinhardt was on tour in Switzerland; he lost most of his earnings in the Swiss Casinos but had some good news while in Zurich from a British Representative of the William Morris Agency. Duke Ellington had sent an invitation for Django to join him on Tour in America. Charles Delaunay who was Django’s self-styled Agent and Manager had previously been over to the US trying to arrange a Tour for Django but failed in his attempts. Django was delighted to inform Delaunay that Duke had sent for him directly, thus bypassing his “Management Fee” Delaunay was none too pleased at this and when Django asked him to accompany him on the trip to act as his interpreter, Delaunay refused. Django arrived in the U.S on 29th October 1946 to tour with the Duke Ellington Orchestra as a guest soloist; the tour would transit the East coast and would include 2 concerts at Carnegie Hall in New York. Django met up with Duke on the 30th October just as Duke was finishing a 2-week stint at the “Aquarium” Nightclub. Django arrived in New York without a Guitar but the William Morris Agency acquired a Gibson ES-300 with a hybrid amplifier just before their 1st Concert on 4th November. The Tour kicked off in Cleveland Ohio, Django was annoyed that the advertising posters did not include his name; the reason being was because they had all been printed before Django had agreed to Duke’s Invitation. The Django set was more or less completely outside the Duke Ellington Orchestra involvement but for the odd Intro, Piano punctuation and Crescendo from the Band and is an interesting portrayal of Django’s inherent talent. Django was clearly fluent with the William Morris Agency issued Gibson ES-300 guitar with his emotive prowess and constant ‘get to know the Archtop’ rehearsal time between events, but it seems that the Amplification Controls were beyond him in such large Venues – the Solo work was still outstanding. He did not have anyone to advise him on his reception within the Auditoriums of huge proportions and no front of house Mixing Desks involved in those days. His finale Chords drown out the Dukes Men even at full lung power. The Audience must have wondered what it was all about, save for a few Guitarists who came to witness it. As for Promoters 16 men idle on the stand was seen as poor value for that section of the Performance. Critics were scathing about some guy with a gut-box of which were a commonplace item in the States. How Django got around and communicated ‘verbally’ with such high-quality Musicians must have been a trial but then he was a Master Musician and could blend in with anything or anyone Musically. 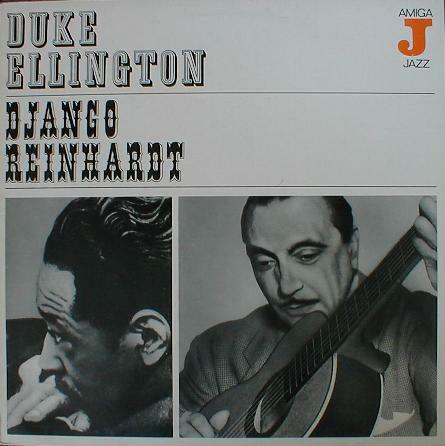 Within a combo fine, but how to make Django a solo feature within Duke’s tightly dedicated Musical Arrangements was clearly a very daunting task for both men. In 1946, Django Toured the United States with Duke Ellington to less than stellar reviews from the Contemporary Critics including the English ex-Patriot Leonard Feather. Django left for the States without a Guitar and fully expected to be presented a gold plated one upon his arrival and to be financially compensated for playing it. This plan, however, did not work out, and he was forced to borrow one. It was not on this tour that Django had first used an Electric Guitar – film exists of him playing an Epiphone. Barney Kessel referred to Reinhardt’s brief stay in the United States, saying, “If Django had wanted to stay in the United States and learn the language, I’m convinced he would have altered the course of Contemporary Jazz Guitar playing — perhaps even the course of the music itself.” When he arrived in the US he asked “where’s Dizzy?” hoping to meet Gillespie, as he had become a big fan of bebop. There was however not enough time, as Reinhardt had to hurry directly to Cleveland for his 1st date of Opening for Ellington. Reinhardt was disappointed to see that his name was not on the flyer promoting the concert. It is unknown whether the Promoters, the William Morris Agency, had not heard of Django or just did not wish to advertise his appearance for fear that he might not show up. The Tour ended with a 2-night stand at Carnegie Hall, the 2nd of which Django arrived too late. Uneasy playing marred his entire stay in America, as he was never able to find a Guitar with which he was comfortable. After the Tour, he played with Clarinettist Edmond Hall‘s Band for 2 weeks in Cafe Society New York, but soon tired of America and wished to return home. He was not able to rivet the attention of a noisy US Cabaret Audience without well established English vocabulary, a Stage Persona and regular Entertaining Patter. When he returned to Paris, he proclaimed Frank Sinatra as the best thing he heard in America – surely not the case sitting in with the Ellington Band. It is appropriate that ‘Duke’ Edward Kennedy Ellington one of the greatest of American composers and Jazz Musician should recognise the true genius of this Belgian Gypsy that he identified after meeting him in 1939 and then from recordings of the Hot Club Quintet and to place him rightly amongst the finest Musicians to be found in the USA – the Duke Ellington Orchestra. The humble but proud Gypsy had listened intently to American jazz recordings and adapted its format with his formidable technique to re-sell his own Manouche Jazz music back to the Originators with European value added. Despite Reinhardt’s great pride in Touring with Ellington (one of his 2 letters to Stephane Grappelli relates this excitement), he wasn’t really integrated into the band, playing only a few tunes at the end of the show, with no special arrangements written personally for him. He was used to his brother, Joseph, carrying around his guitar for him and tuning it. Allegedly, Reinhardt was given an un-tuned Archtiop Guitar to play with (discovered after strumming a Chord) and it took him 5 whole minutes to Concert Tune it. Also, the was used to playing a Selmer Modèle Jazz, the Guitar he made famous, but in large Auditoriums, he was required to play a new Amplified Gibson ES-300 Model and also Master its new hybrid Amplification. 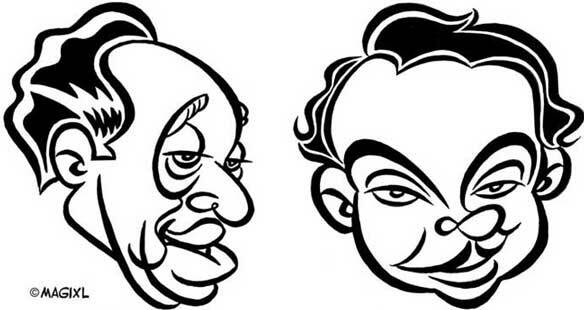 A dark part of Django‘s character was revealed when it was learned that Ellington had also invited Grappelli to Tour America, but Django chose not to tell him… from the different accounts, it looks as if Ellington invited the entire Band, but Django basically accepted the invitation for himself. He thus lost his trusted English language Interpreter. “Django’s playing gave sound to the spirit of Jazz Age Paris. His lines of acoustic guitar notes were a pure rapture, effervescent and evanescent, floating away with an unbearable lightness and transience of the moment, their fleeting beauty almost unbelievable. The genius of all his future music was in embryo in that one solo on Dinah.” At the conclusion of the 1st recording of “Dinah,” Django was so thrilled with his improvisations that he bumped his guitar against his chair as he finished his song, and this ugly noise was recorded, which appears at the end of the piece. The Engineers wanted to throw the whole thing out and start over, but the Hot Club Impresarios were quite happy with the improvisation which was what mattered most to them and convinced the Engineers to keep this recording that eventually became so famous. Duke Ellington, who called Reinhardt “the most creative jazz musician to originate anywhere outside the United States,” invited Reinhardt to come to the US for a tour. Duke paid for his trip. The trip proved to be something of a culture shock. While the 2 legendary Musicians had great respect for each other’s Artistry, they had trouble understanding each other’s languages and habits. When Django arrived, his first words, in a combination of French and English, were, “Where’s Dizzy playing tonight?” Django brought no luggage. He didn’t even bring a Guitar. According to Reinhardt’s Biographer, Charles Delaunay, Django believed American companies would compete with each other for the honour of presenting a Guitar to him. He was wrong and had to find a Guitar when he got to the United States. There is a story that while the full band were waiting on stage at Carnegie Hall for Django – he was happily chatting enthusiastically to a French Boxing Champion – Marcel Cerdan in a local bar – his priorities were clearly self-centred, booze induced or childlike. Django rarely if ever played a solo the same way twice. Numerous recordings prove this to be true. His creative genius was not only that of the master improviser, but also that of the composer, and he can be credited with numerous pieces with beautiful melodies and sophisticated, subtle harmonic structures. However, Django could not read or write musical notation and he was at the mercy of others that could to get his ideas down on paper. This picture is truncated but in the background is an organ and Django was dictating his Mass perhaps through his Guitar playing to a Clarinettist Music writer on his left. Dates included Cleveland, Ohio, Civic Opera House Chicago (Nov 10th 1946), St Louis, Detroit, Kansas City, Aquarium NYC, and closed at Carnegie Hall NYC with 2 nights (November 23rd and 24th). 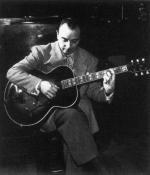 After the Tour Django worked at “Cafe Society” before returning to France allegedly taking the Epiphone and Electar Amp with him which was very likely just an early consideration. After the Duke Tour, he stayed in New York City for a 2-week Residency at the Café Society Uptown. On his nights off Reinhardt would visit Manhattan‘s legendary 52nd Street. In the early 40s musicians like Alto Saxophonist Charlie Parker, Trumpeters Dizzy Gillespie and Miles Davis, Guitarist Charlie Christian, drummer Kenny Clarke and the Pianists Mary Lou Williams and Thelonious Monk had been regulars in the 52nd Street Clubs and the after-hours joints further Uptown. Many of them had grown tired of the Big Band Circuit and were looking for playing situations that allowed more opportunities to improvise at length; a new kind of small-group jazz began to ferment in the smoke-filled ambience of the Nightclubs, and it came to be called Bebop. Django’s 1st Biography called the American tour a failure. He had his reasons for calling it that, partly because he was left out of organizing it and being part of it, but also because it was such a bittersweet experience for Django. While on the one hand, he had great success with Ellington’s Orchestra, on the other he had these naïve dreams of becoming a Movie Star and of recording with all the different American Jazz Stars -dreams that didn’t come true during the 3 months he was in the United States. 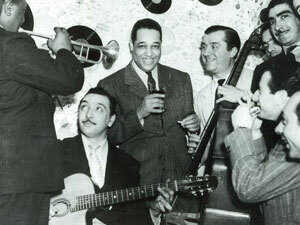 Duke Ellington and His Orchestra with Django Reinhardt. r. Civic Opera House, Chicago, 10 Nov 1946. Personnel – Taft Jordan, Cat Anderson, Francis Williams, Harold Baker, Shelton Hemphill, Ray Nance, trumpet; Lawrence Brown, Claude Jones, Wilbur de Paris, trombone; Jimmy Hamilton, Johnny Hodges, Russell Procope, Al Sears, Harry Carney, reeds; Duke Ellington, piano; Django Reinhardt, guitar; Oscar Pettiford, bass; Sonny Greer, drums. According to biographer Charles Delaunay (son of the husband-and-wife Painters Robert and Sonia), when Reinhardt mounted the stage to rehearse with Duke Ellington on November 18, 1946, in Cleveland, Ohio, the Duke asked him what Key the tune was in. Django told him that he didn’t understand what the word “Key” meant. When they translated it for him, he told Duke to not worry about the Key, just play. A week later, Django was scheduled to play with Duke’s Orchestra at Carnegie Hall in an 8:30 pm Concert. As was so often the case, he was running on “Gypsy Time” and showed up 2 hours late. Despite his tardiness, he thrilled the Audience which gave him a grand ovation that occasioned 6 curtain calls. When Duke Ellington later asked him for an explanation, Django stated that he ran into Boxer and fellow Frenchman Marcel Cerdan (husband of Edith Piaf) on the street. Happy to run into a fellow Countryman in a strange City, the 2 repaired to a Café and chatted for over an hour. This was typical of Django who when not playing before Audiences enjoyed the carefree traditional Gypsy Life. This included whiling away the hours in small talk with his extended family, playing billiards, fishing and driving along country roads. In 1949, after his career had entered a slump (partly the outcome of critics’ anger at his Carnegie Hall lateness), he sold his Paris apartment, bought a Lincoln, attached a Trailer to it, and head out to the open roads of France. Eventually, he hooked up with a larger Caravan that included his mother, who lived in an old Citroën that had been converted into a van. From his camps in the Countryside, he’d venture into Paris for occasional gigs, always making sure to take some money from a fat wad of banknotes that he kept under his pillow. Duke said Django went back to Paris, because somebody at the William Morris Agency had beat him playing Billiards, and he got mad and left. I think Django considered himself to be a great Billiards Player, and he couldn’t stand getting beaten like that.